Who among us hasn’t heard the children in our families ask these sorts of questions or ponder what life was like back when their grandparents were their age? It is our own duty to honor our family histories and preserve a legacy for future generations. Legacy matters. Heritage matters. The shared values and lessons that bind families matter. Details of everyday life add texture and meaning to what it means to be a family. As our matriarchs and patriarchs pass, so too go the stories they inherited from their elders. Children want to know. And we need to help (and encourage!) them to learn about their past. Who doesn’t enjoy looking through old family photographs? It’s amazing how much you can learn about earlier generations by looking at them in a photograph! Yet many of our family photographs are bundled haphazardly in a dusty shoebox in the attic or damp corner of the basement. Take the time to gather the photos together, ask other family members to share theirs, and begin to curate the collection. It may be painstaking work to track down living family members – and even more difficult to identify certain people in the photos – but the process itself is mostly enjoyable and the result well worth it. Buy acid free storage boxes or envelopes and Mylar sleeves to conserve the photos. If at all possible, arrange the images by year, subject, location or some other method of categorization. The elder statesmen in the family can usually be encouraged to talk about the good old days. Some of the best family stories can be told when you allow parents and grandparents to reminisce, perhaps even prompted with a specific question. Create an oral history “project” in which you record, with audio or with written text, the rich history they have to share. Remember, the visual record of the past (photographs) can always be augmented with a voice. Future generations will surely benefit from having these oral histories. Your family history, much like America’s founding, is a story of great travel and settlement. Nothing makes the past come alive more than revisiting these great migrations and former homes. You can visit the childhood residences of past generations and see what has changed (or hasn’t). If your ancestors fought in a war, you can see these battlefields and the history museums that tell the story of the fight. And if you can trace your family history to “the old country,” why not take a trip and see the ancestral homeland? These journeys are as much a part of you as previous generations, and it is your obligation to future generations to make them a part of theirs as well. Ancestry.com. My Family Tree. Family Echo. There are countless family heritage and genealogy applications to help record and sort information you have collected. With little or no cost, these applications are a digital scrapbook of your lineage. They can be shared with those relatives you already know, and can be searched for relatives you don’t. Some options even allow you to have your DNA tested to find your very distant relatives. 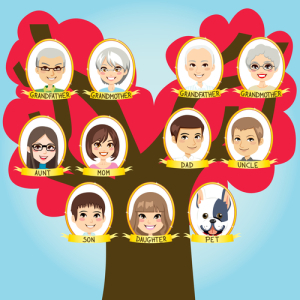 The genealogy apps will even lead you to professional genealogists who can provide detective work to uncover even the toughest family mysteries. Go ahead. Your family deserves to have a family tree that can be looked at and referred to by the younger generations. If you show them how to preserve the family legacy, they will know how to do so when it is their turn.